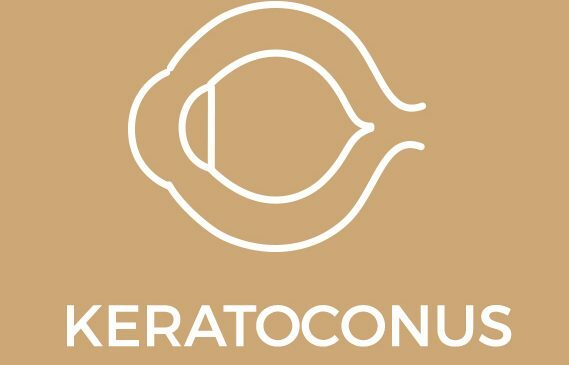 Keratoconus is a progressive, non – inflammatory disease, frequently occurring bilaterally, resulting in thinning of the cornea to form a conical shape. This cone generally occurs inferiorly resulting in irregular astigmatism. 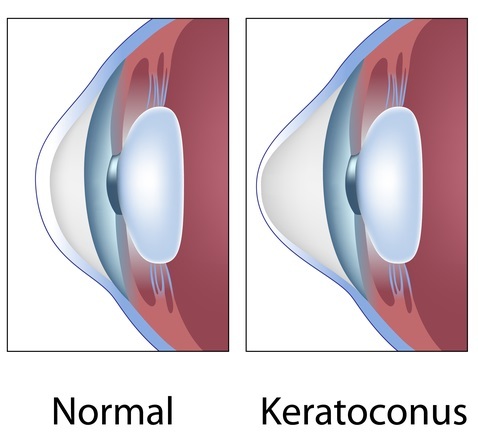 The exact cause of keratoconus is still unclear however there are various theories that hereditary factors may play a role. Approximately 60 – 70% of keratoconic patients frequently rub their eyes and have ocular allergies. During the early stages patients maybe asymptomatic however as the keratoconus progresses the following may become noticeable: reduction in vision due to changing astigmatism, halos, glare, light sensitivity, contact lens intolerance and tired eyes. Treatment methods for keratoconus include cross linking, intrastromal rings and corneal transplants. Cross linking is performed on patients in the early stages of keratoconus with the aim of stabilizing the keratoconus. Cross linking strengthens and creates new collagen bonds in the stroma of the cornea. Patients will still be required to wear contact lenses or spectacles after cross linking, however most will notice an improvement in their refractive error over time. Intrastromal rings are suitable for keratoconic patients who have an intolerance to contact lens wear and progressive steepening of the cornea. The rings aim to flatten the cornea and reduce the amount of irregular astigmatism. Intrastromal rings are composed of a transparent yellow PMMA plastic which is 100 % biocompatible. Depending on the type and severity of the keratoconus, one or two segments may be inserted. The rings maybe extracted or repositioned if necessary. Patients will still be required to wear spectacles or contact lenses after the rings have been inserted. Corneal transplants are performed on patients with severe keratoconus. There are various techniques including an all laser treatment (IEK). These will be discussed with you by the ophthalmologist. At Sandhurst Eye Centre, should a patient require a corneal transplant, there is no waiting period as corneas are sourced from the USA.